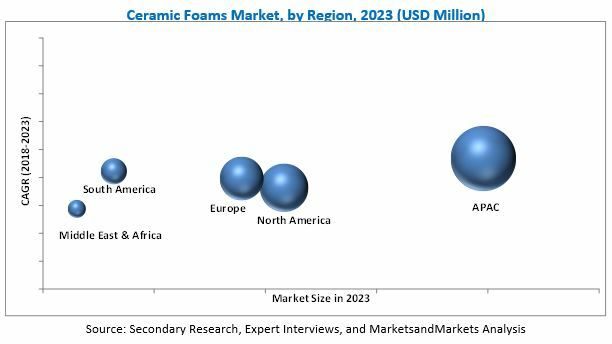 [129 Pages Report] Ceramic Foams Market was valued at USD 327.6 Million in 2017 and is projected to reach USD 441.7 Million by 2023, at a CAGR of 5.2% during the forecast period. In this study, 2017 has been considered as the base year and 2023 as the forecast year to estimate the ceramic foams market size. Note: Core competencies* of companies are determined in terms of their key developments and key strategies adopted by them to sustain their position in the market. Various secondary sources, such as company websites, encyclopedia, directories, and databases, such as Hoovers, Bloomberg, Businessweek, Factiva, and OneSource have been used to identify and collect information useful for this extensive, commercial study of the global ceramic foams market. Primary sources, including experts from related industries, have been interviewed to verify and collect critical information and assess prospects of the market. The top-down approach has been implemented to validate the market size in terms of value. With data triangulation procedures and validation of data through primaries, the exact values of the overall parent market size and individual market sizes have been determined and confirmed in this study. The ceramic foams market has a diversified and established ecosystem of upstream players, such as raw material suppliers and downstream stakeholders, such as manufacturers, vendors, end users, and government organizations. This study answers several questions for stakeholders, primarily, which market segments they should focus on during the next two to five years to prioritize their efforts and investments. These stakeholders include ceramic foams manufacturers such as Ultramet (US), Vesuvius Plc (UK), SELEE Corporation (US), ERG Aerospace Corp. (US), Saint-Gobain High-Performance Refractories (US), Pyrotek (US), Induceramics (US), LANIK s.r.o (Czech Republic), Drache GmbH (Germany), and Baoding Ningxin New Material Co., Ltd. (China). This research report categorizes the global ceramic foams market based on type, application, end-use industry, and region, and forecasts revenue growth and provides an analysis of trends in each of the submarkets. Each application is further described in detail in the report, with value forecasts until 2023. Each end-use industry is further described in detail in the report, with value forecasts until 2023. Each region is further segmented by key countries, such as China, India, Japan, South Korea, the US, Mexico, Canada, Germany, the UK, Italy, France, Russia, Turkey, South Africa, Argentina, and Brazil. The global ceramic foams market is estimated to be USD 343.2 Million in 2018 and is projected to reach USD 441.7 Million by 2023, at a CAGR of 5.2% between 2018 and 2023. The market is witnessing growth due to the increasing use of ceramic foams as filters in the metal casting industry and stringent regulations regarding pollution control. The growth is further driven by the demand for thermally insulated and soundproof residential and non-residential infrastructure. Silicon carbide was the largest type of ceramic foam consumed in 2017. Silicon carbide is a high-quality advanced-grade ceramic used to manufacture foams. Properties such as high strength, low thermal expansion, excellent thermal shock resistance, high wear resistance, and high chemical resistance make silicon carbide a preferred material for ceramic foams in the iron casting application. Thus, these factors are expected to drive the consumption of silicon carbide-based ceramic foams in the future. Based on application, molten metal filtration was the largest segment of the global ceramic foams market in 2017. This can be attributed to the growing demand for iron, steel, and aluminum casting across all industrial verticals. This trend is responsible for the increased use of ceramic foams in the molten metal filtration application. Foundry was the largest end-use industry segment of the ceramic foams market in 2017. The ncrease in the production of consumer electronics and automobiles as a result of rapidly evolving economies across the globe is expected to drive the growth of the foundry industry, thereby propelling the growth of the ceramic foams market. APAC was the largest market for ceramic foams in 2017 and this market in APAC is projected to grow at the highest CAGR during the forecast period. Building & construction activities have increased exponentially in the past decade due to favorable demographics and a wide-scale manufacturing base in the region. The growth in metal casting production, especially in India and China, has propelled the demand for ceramic foams in the region. Factors restraining and challenging the growth of the ceramic foams market are high capital-intensive production techniques and lack of recyclability and reparability of ceramic foams respectively. 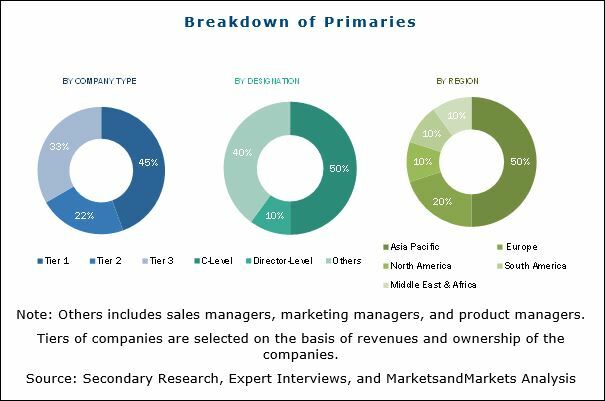 Vesuvius Plc (UK), SELEE Corporation (US), Saint-Gobain High-Performance Refractories (US), LANIK s.r.o (Czech Republic), and Drache GmbH (Germany) are the leading players in the global ceramic foams market. These players are major manufacturers of ceramic foams and gaining a strong foothold in the market through the strategy of mergers & acquisitions. 11.10 Boading Ningxin Cast Material Co., Ltd.
12.1 Ferro-Term Sp. Z O.O. 12.5 Filtec Precision Ceramics Co., Ltd.
12.7 Pingxiang Hualian Chemical Ceramic Co., Ltd.
12.8 Altech Alloys India Pvt. Ltd.
12.12 Jincheng Fuji Material Co., Ltd.
12.13 Pingxiang Yingchao Chemical Packing Co., Ltd.